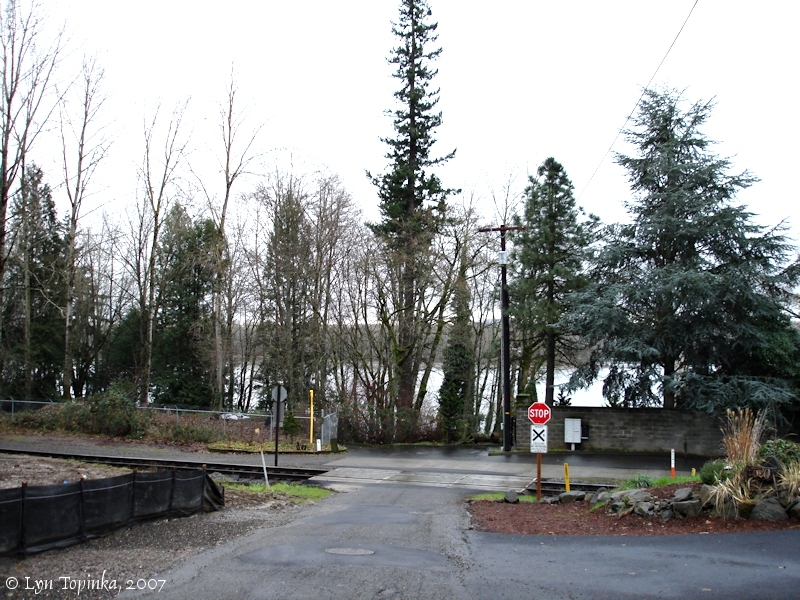 "Ellsworth and Ellsworth Springs, Vancouver, Washington"
Click image to enlarge End of the road, Ellsworth area, Vancouver, Washington. Looking south towards the Columbia River. Image taken December 30, 2007. Ellsworth, Washington, is a small town on the Columbia River located six miles east of Vancouver at Columbia River Mile (RM) 111.5. 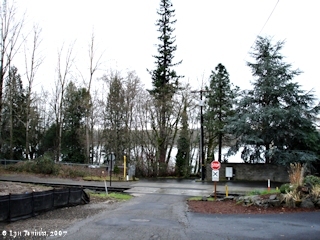 Upstream is the Vancouver Trout Hatchery and Fisher's Landing, and downstream is Image, Lieser Point and Wintler Park. According to Robert Hitchman in Place Names of Washington (1985), the town of Ellsworth was founded in 1886 by a group of families from St. Paul and Minneapolis, Minnesota, and from Omaha, Nebraska. The group journeyed west and named their town after their organizer, Elmer Ellsworth. Elmer Ellsworth never saw the place however, as he was killed before the group moved to Clark County. Early maps of Washington show the development of the early Columbia River communities from Vancouver east to Camas, including Image, Ellsworth, and Fisher. Cram's 1883 "Rail road & township map of Washington" shows "Vancouver" and the "Fisher's P.O.". Cram's 1889 "Railroad and county map of Washington" shows "Vancouver", "Vancouver Barracks", "Fisher's", and then "La Camas". The 1897 Post Route Map of the State of Washington, in operation on the 1st of September, 1897" shows "Vancouver" and "Fisher". Cram's 1904 "Map of Washington" shows "Vancouver" and "Vancouver Sta. ", "Fisher", and "Camas". The 1905 edition of the 1896 U.S. Geological Survey 1:62500 topographic map for "Portland, Oreg." shows "Vancouver", "Vancouver Barracks", "Russell Landing", "Ellsworth", and "Fishers". The 1908 "Railroad Commission Map of Washington, 1908" shows "Vancouver", "Ellsworth", "Fisher", and "La Camas". The 1910 "Railroad Commission Map of Washington, 1910" shows "Vancouver", "Image", "Ellsworth", "Fisher", "Kiernan", and "Camas". Cram's 1911 map shows "Vancouver" and "V. Sta. ", "Image", "Ellsworth", "Fisher", and "Camas". Cram's 1925 map of Washington shows "Vancouver", "Ellseworth", "Fisher", and "Camas". The 1928 "Railroad Map of Washington, 1928" shows "Vancouver", "McLoughlin", "Image", "Ellsworth", "Fisher", "Prune Hill", and then "Camas". The ca.1915-1922 Plat Map for Clarke County (found on "rootsweb.com", 2011) shows the three communities of "Image", "Ellsworth", and "Fishers". "Ellsworth: The area is also known as Image, and is now the name for a road and a school. Residents petitioned successfully in 1957 to keep a name they said had a 75-year history when the county began numbering its roads, but the origin of Ellsworth - or Image - could not be discovered." "... ELLSWORTH, (48 alt., 60 pop. ), is a small settlement around the Ellingsworth Company, which operates during the salmon run on the Columbia. West of Ellsworth prune orchards are abundant. In the spring their pink blossoms soften the landscape and their heavy, fragrant odor scents the air. Large drying bins for the ripe, picked fruit stand in each orchard. ..."
Neighbor Who Objects to "Nauseous Odors" Fails to Get Damages. VANCOUVER, Wash., Dec. 12. -- (Special.) -- The Columbia River Packers' Association, operating among other plants a salmon cannery at Ellsworth, five miles east of Vancouver, on the Columbia River, won the $17,000 damage suit brought by Mrs. Lulu Kingsbury in the Superior Court of Clarke County. The jury returned a verdict last night. Mrs. Kingsbury sued to collect $14,000, alleged to be the amount her property has been damaged on account of the nauseous odors sent out by the cannery, and the noises at night; and $3000 because these odors were so bad that her husband could no longer live there and bear them. Her property adjoins the cannery property." Source: "The Morning Oregonian", Friday, December 13, 1918, courtesy University of Oregon Historic Newspapers Digital Archives, 2015. The Rooster Rock Cannery originally existed on the west side of Rooster Rock, Oregon, in the small bay between Tunnel Point and Rooster Rock. The Cannery was built by Antone Fastabend for Samuel Elmore, who had a large Cannery business in Astoria, Oregon. Because of constant silting of the bay where the cannery was located, it eventually was forced to move to Ellsworth on the Washington shore. "The use of the fish-wheels and the large quantities caught by them, caused canneries to be built on the upper Columbia. Warrendale was the first one, then one at Celilo by Everding & Farrell, then McGowan's, and later the Columbia River Packers Association, who built at Rooster Rock -- since moved across the river to Ellsworth." Source: Pacific Fisherman: Yearbook, 1918. Springs are plentiful in the gravel deposits along the 25-square-mile Columbia Slope watershed which exists between Vancouver, Washington and Camas, Washington. The City of Vancouver once used springs near Ellsworth as a water source, and originally the water for the Vancouver Trout Hatchery came from spings issuing forth from the hillsides. "... Many springs flow from a six-mile stretch of the Columbia Slope between Marine Park in Vancouver and the Fisher's Landing area near Camas. Most of the springs flow from gravel deposits in the hillsides above the Columbia River. Ellsworth Springs, west of the Interstate 205 bridge, was a source of drinking water for the city for many years. In 1973, the city stopped using the springs because of elevated nitrate concentrations, most likely from septic tanks in large areas of east Vancouver. From the late 1800s to 1973, Ellsworth Springs supplied as much as four million gallons per day of the city of Vancouver's drinking water. In 1949, the U.S. Geological Survey found that Columbia Slope springs discharged approximately 35 cubic feet of water per second. Salmon and Lacamas creeks flow at about this rate during the summer. In a 1988 update, the Geological Survey found that Ellsworth and a few other springs near I-205 flowed at rates similar to those measured in 1949. The other springs had a 40 percent decrease in flow. The large springs that supplied cold, clear water to Vancouver Trout Hatchery had decreased to 5 and 20 percent, which forced the hatchery to drill wells in the late 1980s. ... "
The source of the water supply of the city of Vancouver is found in several large springs situated about four miles from town. Here the first named corporation owns several acres of ground and below the springs, in 1878, a reservoir or dam was constructed, capable of holding, in round numbers, two million gallons of water. It is substantially built and fitted with proper connections for the main pipe, which is laid a distance of about twenty-two thousand feet, to the city reservoirs, and made of selected yellow fir logs. At the lower end of the upper main are located two reservoirs, substantially built, roofed over and with a capacity of thirty-five thousand and three hundred thousand gallons respectively. The total cost of the work was in the neighborhood of thirty thousand dollars. The fall between the reservoirs and the source is twenty-two feet and about one foot to the thousand. The head of water on Main street is about seventy feet, sufficient for any high building, while the quantity that can be utilized is abundant for a city of twenty thousand inhabitants. ..."